How does the local institutional context influence the configuration of collaborative housing models? This is the research question of a recently published article in the International Journal of Housing Policy co-authored by IFI-Researcher Richard Lang. 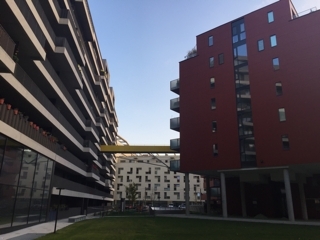 Although Austria has a well-established cooperative sector, few empirical studies and no comprehensive overviews have been published on collaborative housing. This paper aims to fill this research gap by extending existing work on organisational models within Austrian non-profit housing. The contribution reports original research based on qualitative expert interviews and case studies completed in 2015. The focus of the empirical analysis is on two local housing contexts with current collaborative housing activity, Vienna and Salzburg. The findings highlight the importance of partnerships with large cooperatives and the key role of local authorities for the development of collaborative housing initiatives. The main contributions of the paper can be seen in feeding into on- going international comparative research on collaborative housing sectors and on the changing institutional landscapes of housing systems. The paper is a key research output of Richard’s Marie Curie and APART Fellowship projects.